If you’re not already a member of LinkedIn, perhaps you’re familiar with the following scenario: you wake up on a lovely Monday morning, high-tail it in to work with only minutes to spare before your shift at the factory plant or in the cubicle farm or out at the library begins; you pull up Microsoft Outlook to check your email and set up your day’s schedule, only to find … thirteen emails from friends who want to “add” you to their “professional network on LinkedIn”? What in blazes does that mean? Is it a scam or something? No, it’s not a scam–I promise! The emails are just an incredibly weird side effect and the only negative feature I know of to setting up a LinkedIn account. 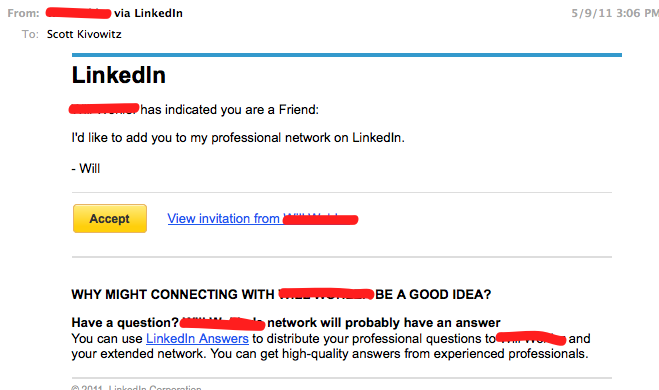 (When new LinkedIn users have the chance to add friends to their network, the website mines their email contacts to generate networking possibilities, and doesn’t visually make it clear which of the folks you click on to connect with already have accounts and which ones do not). So while the emails may clutter up your inbox, they’re not meant to be malicious–either on the part of LinkedIn, or the friends who send them. All this begs the question: What exactly is LinkedIn, and how can a self-published or self-publishing author best make use of the platform? This social networking website touts itself as “The World’s Largest Professional Network,” is run by CEO Jeff Weiner (of Yahoo! fame) and a board chaired by founder Reid Hoffman (of PayPal and SocialNet.com fame) with the purported goal of connecting users interested in more career-driven networking than is made possible by, say, Facebook and Instagram. It seems to be doing a fairly good job of achieving this end, as its approximately 364-million-strong user base can attest. Any self-published author looking for a new weapon in his or her repertoire should definitely keep LinkedIn at the top of the shortlist! LinkedIn certainly attracts a different user base from, say, Snapchat–but that doesn’t mean its users aren’t making full use of the platform’s more “social” aspects for recreation and enjoyment. And as this article on the Daily Dot points out, industry professionals are being led into blogging and socializing by the platform–book lovers and self-publishing author’s don’t have to fight or struggle to carve out a niche … it already exists. Users log in to LinkedIn, on average, less frequently than the average Facebook user (according to Mashable in 2013, the average Facebooker checked the app 15 times a day). But engagement on LinkedIn is, contrary to some folks expectations, extraordinarily high. This may be because LinkedIn is a destination website, a place to go rather than a place to go through to get somewhere else or to burn some free time. Users see LinkedIn as a tool, and they’re more likely to actually read the blog posts (for example) that they see on there than ones they might stumble across elsewhere. But what is a self-published author to do? Setting up a LinkedIn profile will benefit anyone, but what are some ways that an author can make special use of the platform? 1. Groups, groups groups. Other social media platforms have group discussion boards–last week, for example, I specifically pointed out Etsy’s group features–but not all groups are created equal. What may seem perfunctory or underdeveloped or a programming afterthought elsewhere has been brought close to perfection on LinkedIn. You can tell that group memberships and discussions were a priority of the website’s developers, as the interface is clean and smooth and easy to interact with. You can find or create groups, manage groups, join groups, and participate in groups you’re interested in without worrying about the content being dumped straight into indexing search engines for everyone running a Google search to see–LinkedIn’s algorithm is much more picky in what it offloads than, say, Goodreads’. You can customize the privacy settings of the groups you manage, rendering some public and free to join, and others private or invitation only. And all that I said above about user engagement being high on LinkedIn? There’s no better place to see this engagement lived out in the round than in LinkedIn’s many active groups. So: join a few! Start a few discussions! 2. Keep tabs on the “Topics” page. 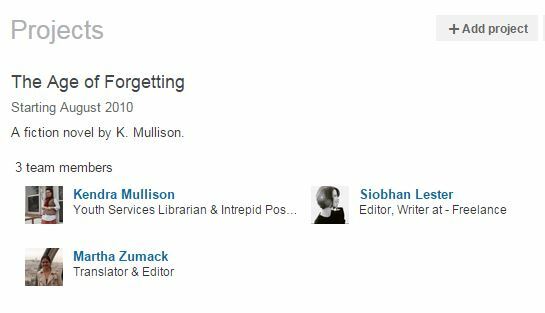 A simple search shows a beautifully put-together page in the Topics section of LinkedIn dedicated to none other than the subject of self-publishing. These Topics pages serves as a kind of constantly-updated newsletter of everything posted to the website–articles, blog posts, groups discussions, presentations, companies, and industry trends–that relates. You can find what characteristics or “skills” LinkedIn users engaged in self-publishing share (“Creative Writing” and “Editing” the top two–no surprise there! ), or you can access a slideshow on “How to Write a Book in 10 Days” … just to provide two examples among many. Don’t underestimate LinkedIn’s Topics! 3. Make it your first stop on the research train. Are you looking to self-publish and you haven’t decided what company best represents your interests? Many indie, hybrid, and self-publishing companies keep active LinkedIn pages, and you can take full advantage of this by connecting with the company itself or any of its employees who also have LinkedIn profiles. 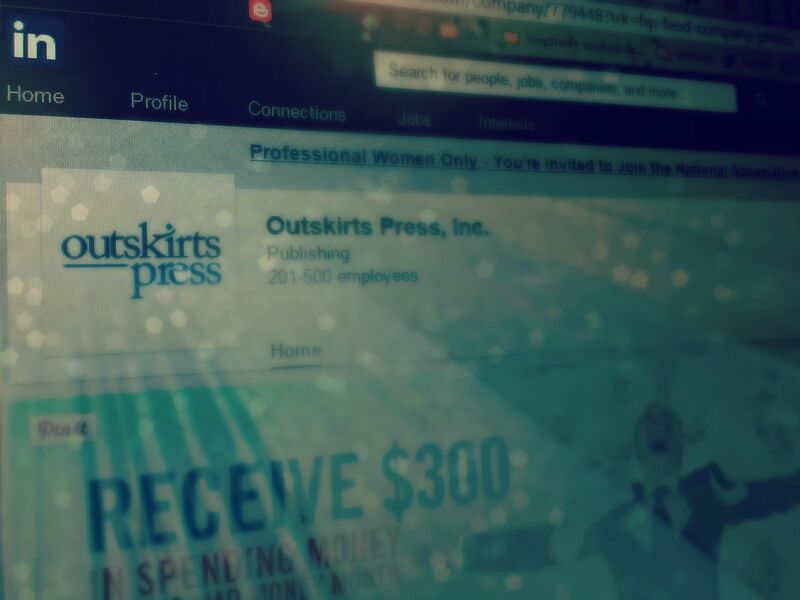 Outskirts Press is a great example of a hybrid publishing company with a rich LinkedIn presence–many of its authors, author representatives, and executives are present there. You can do your due diligence with ease, just by perusing a company’s profile and exploring the information presented there. Want to know if you can trust a company to provide the best quality print on demand books for you? Want to find agents, editors, or other collaborators? Check LinkedIn. 4. Boost your credibility. As I’ve mentioned already, LinkedIn attracts users who are highly engaged but who are also looking specifically to build business-oriented networks. Accounts are reviewed by LinkedIn staff to verify that users are not using fake or ridiculous names, which is just one layer of the self-reinforcing professionalism that makes LinkedIn special. If you want to create a brand around your name as a self-published author, there’s literally no better place to get started. Creating a polished LinkedIn profile that takes full advantage of the metadata and the form available (enter as much information as possible to make yourself as findable as possible!) will allow you to feel confident that a publisher or agent who Googles your name comes up with something that confirms your reliability, credibility, and professionalism. There’s not much more you can do to help yourself stand out from the pack! 5. Use the Pulse. Just over a year ago, LinkedIn opened up its “Pulse” blogging platform to all users–a privilege that had previously been reserved for about 500 key “Influencers.” Perhaps because it began with such constraints, Pulse retains some of its aura as a voice for the truly expert, and it’s a beautiful illustration of how a blog can indeed be seamlessly wound up with a social network. Pulse offers all or most of the features you might find on a blog platform like WordPress, with great customizability and the option to include hyperlinked text. Posts on Pulse automatically display as both a part of your user profile and your connections’ home page feeds. They show up in search engine results, too. The best part about Pulse is that you don’t have to use it as a blog if you don’t want to–you can use it as a secondary publishing platform. Because Pulse allows for beautiful long-form posts, you could feasibly offer whole chapters or even an entire book (in chapters) for your connections to read! The “Projects” section of your LinkedIn profile is an excellent–and under-utilized!–feature that you should definitely take a second look at. Why? Because it’s not just a spot to list ongoing works in progress … it’s a fully linkable and functional tool. You can connect a project to an Amazon book listing, an author webpage, and to its actual editorial or publishing team! I mean, how neat. Best of all, the projects section is a dedicated space, which means that the information you input there won’t get shuffled off of your profile page or lost in the aether. Unless you choose to remove it, a book you list as a project becomes a permanent feature of both your page and the page of any other collaborators who confirm their connection to it!